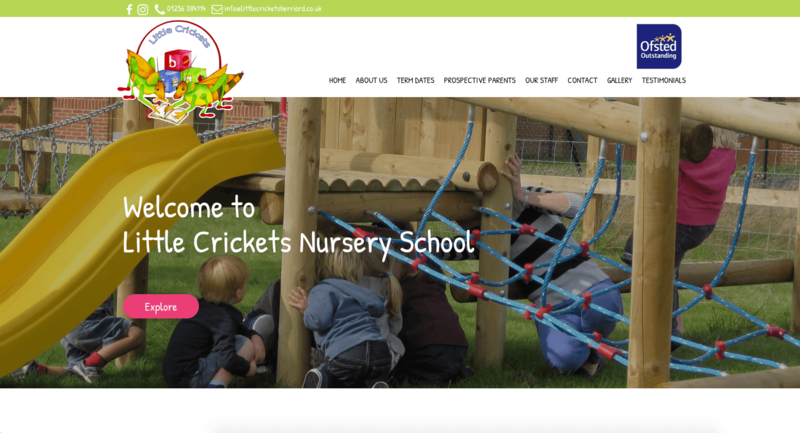 This month's website of the month goes to Little Crickets Nursery School . Little Crickets Nursery School is based in Basingstoke, Hampshire. They promote a caring and happy environment where children feel both special and secure. The website features an mixed colour scheme of pink, green and blue. Each colour has been taken from the Nursery logo. The website features scrolling images at the top of the homepage, parallax image panels and a collage gallery with hover effects. The website is also SSL Secure. Little Crickets use their own images throughout the site; of the Nusery itself, children playing and arts & crafts by the children. The website also has a custom background graphic containing all-things Little Crickets related.